How do lasers work? 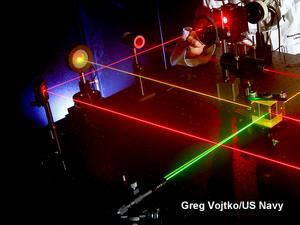 | Who invented the laser? Lasers are amazing light beams powerful enough to zoom miles into the sky or cut through lumps of metal. Although they seem pretty recent inventions, they've actually been with us over half a century: the theory was figured out in 1958; the first practical laser was built in 1960. At that time, lasers were thrilling examples of cutting-edge science: secret agent 007, James Bond, was almost chopped in half by a laser beam in the 1964 film Goldfinger. But apart from Bond villains, no-one else had any idea what to do with lasers; famously, they were described as "a solution looking for a problem." Today, we all have lasers in our homes (in CD and DVD players), in our offices (in laser printers), and in the stores where we shop (in barcode scanners). Our clothes are cut with lasers, we fix our eyesight with them, and we send and receive emails over the Internet with signals that lasers fire down fiber-optic cables. Whether we realize it or not, all of us use lasers all day long, but how many of us really understand what they are or how they work? The basic idea of a laser is simple. It's a tube that concentrates light over and over again until it emerges in a really powerful beam. But how does this happen, exactly? What's going on inside a laser? Let's take a closer look! Photo: A scientific experiment to check the alignment of optical equipment using laser beams, carried out at the US Navy's Naval Surface Warfare Center (NSWC). Photo by Greg Vojtko courtesy of US Navy. Lasers are more than just powerful flashlights. The difference between ordinary light and laser light is like the difference between ripples in your bathtub and huge waves on the sea. You've probably noticed that if you move your hands back and forth in the bathtub you can make quite strong waves. If you keep moving your hands in step with the waves you make, the waves get bigger and bigger. Imagine doing this a few million times in the open ocean. Before long, you'd have mountainous waves towering over your head! A laser does something similar with light waves. It starts off with weak light and keeps adding more and more energy so the light waves become ever more concentrated. Photo: It's much easier to make laser beams follow precise paths than ordinary light beams, as in this experiment to develop better solar cells. Picture by Warren Gretz courtesy of US DOE/NREL (Department of Energy/National Renewable Energy Laboratory). Where a flashlight produces "white" light (a mixture of all different colors, made by light waves of all different frequencies), a laser makes what's called monochromatic light (of a single, very precise frequency and color—often bright red or green or an invisible "color" such as infrared or ultraviolet). Where a flashlight beam spreads out through a lens into a short and fairly fuzzy cone, a laser shoots a much tighter, narrower beam over a much longer distance (we say it's highly collimated). Where the light waves in a flashlight beam are all jumbled up (with the crests of some beams mixed with the troughs of others), the waves in laser light are exactly in step: the crest of every wave is lined up with the crest of every other wave. We say laser light is coherent. Think of a flashlight beam as a crowd of commuters, pushing and shoving, jostling their way down the platform of a railroad station; by comparison, a laser beam is like a parade of soldiers all marching precisely in step. These three things make lasers precise, powerful, and amazingly useful beams of energy. Before you can understand how a laser works, you need to know how an atom can give off light. If you're not sure how this happens, take a look at the box how atoms make light in our introductory article about light. What do you need to make a laser? A load of atoms (a solid, liquid, or gas) with electrons in them that we can stimulate. This is known as the medium or, sometimes, the amplifying or "gain" medium (because gain is another word for amplification). Something to stimulate the atoms with, such as a flash tube (like the xenon flash lamp in a camera) or another laser. 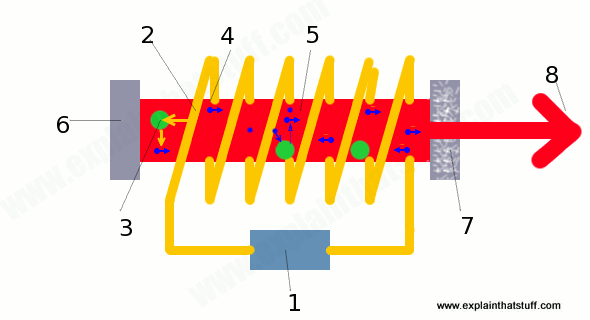 A typical red laser would contain a long crystal made of ruby (the medium, shown in the artwork below as a red bar) with a flash tube (yellow zig-zag lines) wrapped around it. The flash tube looks a bit like a fluorescent strip light, only it's coiled around the ruby crystal and it flashes every so often like a camera's flash lamp. How do the flash tube and the crystal make a laser beam? Every time the tube flashes, it "pumps" energy into the ruby crystal. The flashes it makes inject energy into the crystal in the form of photons. Atoms in the ruby crystal (large green blobs) soak up this energy in a process called absorption. Atoms absorb energy when their electrons jump to a higher energy level. After a few milliseconds, the electrons return to their original energy level (ground state) by giving off a photon of light (small blue blobs). This is called spontaneous emission. How do lasers make light? If that's as much detail as you want to know about lasers, you can stop reading now or skip further down the page to types of lasers. This section goes over the same points from the box above in a bit more detail, and a little bit more "theoretically." You'll often read in books that "laser" stands for Light Amplification by Stimulated Emission of Radiation. That's a complex and confusing mouthful but, if you pull it apart slowly, it's actually a very clear explanation of how lasers make their super-powerful beams of light. Let's start with the "R" of laser: radiation. The radiation lasers make has nothing to do with dangerous radioactivity, the stuff that makes Geiger counters click, which atoms spew out when they smash together or fall apart. Lasers make electromagnetic radiation, just like ordinary light, radio waves, X rays, and infrared. Although it's still produced by atoms, they make ("emit") it in a totally different way, when electrons jump up and down inside them. We can think of electrons in atoms sitting on energy levels, which are a bit like rungs on a ladder. Normally, electrons sit at the lowest possible level, which is called the atom's ground state. If you fire in just the right amount of energy, you can shift an electron up a level, onto the next rung of the "ladder." That's called absorption and, in its new state, we say the atom's excited—but it's also unstable. It very quickly returns to the ground state by giving off the energy it absorbed as a photon (a particle of light). We call this process spontaneous emission of radiation: the atom is giving off light (emitting radiation) all by itself (spontaneously). Photo: From candles to light bulbs and fireflies to flashlights, all conventional forms of light work through the process of spontaneous emission. 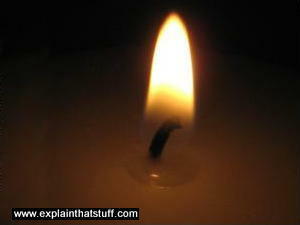 In a candle, combustion (the chemical reaction between oxygen and fuel, in this case, wax) excites atoms and makes them unstable. They give off light when they return to their original (ground) states. Every photon produced by spontaneous emission inside this candle flame is different from every other photon, which is why there's a mixture of different wavelengths (and colors), making "white" light. The photons emerge in random directions, with waves that are out of step with one another ("out of phase"), which is why candlelight is much weaker than laser light. Normally, a typical bunch of atoms would have more electrons in their ground states than their excited states, which is one reason why atoms don't spontaneously give off light. But what if we excited those atoms—pumped them full of energy—so their electrons were in excited states. In that case, the "population" of excited electrons would be bigger than the "population" in their ground states, so there would be plenty of electrons ready and willing to make photons of light. We call this situation a population inversion, because the usual state of affairs in the atoms is swapped around (inverted). Now suppose also that we could maintain our atoms in this state for a little while so they didn't automatically jump back down to their ground state (a temporarily excited condition known as a meta-stable state). Then we'd find something really interesting. If we fired a photon with just the right energy through our bunch of atoms, we'd cause one of the excited electrons to jump back down to its ground state, giving off both the photon we fired in and the photon produced by the electron's change of state. Because we're stimulating atoms to get radiation out of them, this process is called stimulated emission. We get two photons out after putting one photon in, effectively doubling our light and amplifying it (increasing it). These two photons can stimulate other atoms to give off more photons, so, pretty soon, we get a cascade of photons—a chain reaction—throwing out a brilliant beam of pure, coherent laser light. What we've done here is amplify light using stimulated emission of radiation—and that's how a laser gets its name. Artwork: How lasers work in theory: Left: Absorption: Fire energy (green) into an atom and you can shift an electron (blue) from its ground state to an excited state, which usually means pushing it further from the nucleus (gray). Middle: Spontaneous emission: An excited electron will naturally jump back to its ground state, giving out a quantum (packet of energy) as a photon (green wiggle). Right: Stimulated emission: Fire a photon near a bunch of excited atoms and you can trigger a cascade of identical photons. One photon of light triggers many, so what we've got here is light amplification (making more light) by stimulated emission of (electromagnetic) radiation—LASER!. What makes laser light so different? If that's how lasers make light, why do they make a single color and a coherent beam? It boils down to the idea that energy can only exist in fixed packets, each of which is called a quantum. It's a bit like money. You can only have money in multiples of the most basic unit of your currency, which might be a cent, penny, rupee, or whatever. You can't have a tenth of a cent or a twentieth of a rupee, but you can have 10 cents or 20 rupees. The same is true of energy, and it's particularly noticeable inside atoms. Like the rungs on a ladder, the energy levels in atoms are in fixed places, with gaps in between them. You can't put your foot anywhere on a ladder, only on the rungs; and in exactly the same way, you can only move electrons in atoms between the fixed energy levels. To make an electron jump from a lower to a higher level, you have to feed in a precise amount (quantum) of energy, equal to the difference between the two energy levels. When electrons flip back down from their excited to their ground state, they give out the same, precise amount of energy, which takes the form of a photon of light of a particular color. Stimulated emission in lasers makes electrons produce a cascade of identical photons—identical in energy, frequency, wavelength—and that's why laser light is monochromatic. The photons produced are equivalent to waves of light whose crests and troughs line up (in other words, they are "in phase")—and that's what makes laser light coherent. 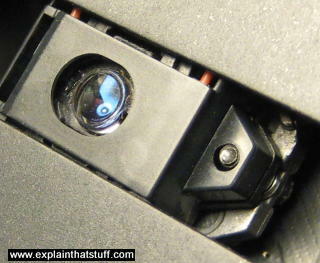 Photo: Lasers—as most of us we know them: This is the laser and lens that scans discs inside a CD or DVD player. The small circle on the bottom right is a semiconductor laser diode, while the larger blue circle is the lens that reads the light from the laser after it's bounced off the shiny surface of the disc. Since we can excite many different kinds of atoms in many different ways, we can (theoretically) make many different kinds of lasers. In practice, there are only a handful of common kinds, of which the five best known are solid-state, gas, liquid dye, semiconductor, and fiber. Solids, liquids, and gases are the three main states of matter—and give us three different kinds of lasers. Solid-state lasers are like the ones I illustrated up above. The medium is something like a ruby rod or other solid crystalline material, and a flashtube wrapped around it pumps its atoms full of energy. To work effectively, the solid has to be doped, a process that replaces some of the solid's atoms with ions of impurities, giving it just the right energy levels to produce laser light of a certain, precise frequency. 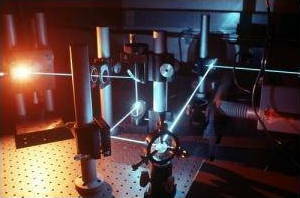 Solid-state lasers produce high-powered beams, typically in very brief pulses. Gas lasers, by contrast, produce continuous bright beams using compounds of noble gases (in what are called excimer lasers) or carbon dioxide (CO2) as their medium, pumped by electricity. CO2 lasers are powerful, efficient, and typically used in industrial cutting and welding. Liquid dye lasers use a solution of organic dye molecules as the medium, pumped by something like an arc lamp, a flash lamp, or another laser. Their big advantage is that they can be used to produce a broader band of light frequencies than solid-state and gas lasers, and they can even be "tuned" to produce different frequencies. While solid, liquid, and gas lasers tend to be large, powerful, and expensive, semiconductor lasers are cheap, tiny, chip-like devices used in things like CD players, laser printers, and barcode scanners. They work like a cross between a conventional Light-emitting diode (LED) and a traditional laser. Like an LED, they make light when electrons and "holes" (effectively, "missing electrons") hop about and join together; like a laser, they generate coherent, monochromatic light. That's why they're sometimes referred to as laser diodes (or diode lasers). You can read more about them in our separate article about semiconductor laser diodes. Finally, fiber lasers work their magic inside optical fibers; in effect, a doped fiber-optic cable becomes the amplifying medium. They're powerful, efficient, reliable, and make it easy to pipe laser light to wherever it's needed. When Theodore Maiman developed the first practical laser, few people realized how important these machines would eventually become. Goldfinger, the 1964 James Bond movie, offered a tantalizing glimpse of a future where industrial lasers could slice like magic through anything in their path—even secret agents! Later the same year, reporting on the award of the Nobel Prize in Physics to the laser pioneer Charles Townes, The New York Times suggested that "a laser beam could, for example, carry all the radio and television programs in the world plus several hundred thousand telephone calls simultaneously. It is used extensively for range-finding and missile-tracking." Over half a century later, applications like this—precision tools, digital communication, and defense—remain among the most important uses of lasers. 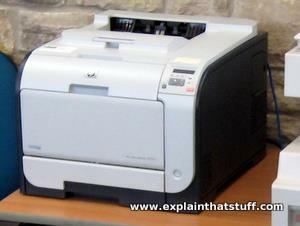 Photo: Every time it prints a document, the laser printer on your desk is busily stimulating zillions of atoms! The laser inside it is used to draw a very precise image of the page you want to print onto a large drum, which picks up powered ink (toner), and transfers it onto paper. Cutting tools based on CO2 lasers are widely used in industry: they're precise, easy-to-automate, and, unlike knives, never need sharpening. Where pieces of cloth were once cut by hand to make things like denim jeans, now fabrics are chopped by robot-guided lasers. They're faster and more accurate than humans and can cut multiple thicknesses of fabric at once, which improves efficiency and productivity. The same precision is equally important in medicine: doctors routinely use lasers on their patients' bodies. for everything from blasting cancer tumors and cauterizing blood vessels to correcting problems with people's vision (laser-eye surgery, fixing detached retinas, and cataract treatments all involve lasers). Lasers form the bedrock of all kinds of 21st-century digital technology. Every time you swipe your shopping through a grocery store barcode scanner, you're using a laser to convert a printed barcode into a number that the checkout computer can understand. When you watch a DVD or listen to a CD, a semiconductor laser beam bounces off the spinning disc to convert its printed pattern of data into numbers; a computer chip converts these numbers into movies, music, and sound. Along with fiber-optic cables, lasers are widely used in a technology called photonics—using photons of light to communicate, for example, to send vast streams of data back and forth over the Internet. 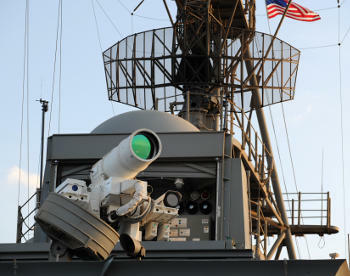 Photo: Are laser weapons the future? This is the US Navy's Laser Weapon System (LaWS), which was tested onboard the USS Ponce in 2014. There are no expensive bullets or missiles with a laser gun like this, just an endless supply of fiercely directed energy. Photo by John F. Williams courtesy of US Navy. The military has long been one of the biggest users of this technology, mainly in laser-guided weapons and missiles. Despite its popularization in movies and on TV, the sci-fi idea of laser weapons that can cut, kill, or blind an enemy remained fanciful until the mid-1980s. In 1981, The New York Times went so far as to quote one "military laser expert" saying: "It's just silly. It takes more energy to kill a single man with a laser than to destroy a missile." Two years later, long-range laser weapons officially became the bedrock of US President Ronald Reagan's controversial Strategic Defense Initiative (SDI), better known as the "Star Wars program". The original idea was to use space-based, X ray lasers (among other technologies) to destroy incoming enemy missiles before they had time to do damage, though the plan gradually fizzled out following the collapse of the Soviet Union and the end of the Cold War. Even so, defense scientists have continued to transform laser-based missiles from science fiction into reality. The US Navy first began testing LaWS (Laser Weapon System) onboard the USS Ponce ship in the Persian Gulf in 2014. Using solid-state lasers pumped by LEDs, it was designed to damage or destroy enemy equipment more cheaply and precisely than conventional missiles. The tests proved successful, and the Navy announced contracts to build more LaWS systems in 2018. Meanwhile, the development of space lasers continues, though none have so far been deployed. Photo: Scientists at Lawrence Livermore National Laboratory in California developed the world's most powerful laser, National Ignition Facility (NIF), for nuclear research. Housed in a 10-story building occupying an area as big as three football fields, it uses 192 separate laser beams to deliver up to 500 trillion watts of power (100 times more energy than any other laser), generating temperatures of up to 100 million degrees. 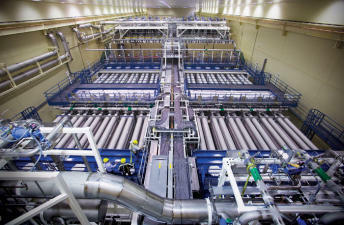 NIF cost a total of $3.5 billion and is expected to power cutting-edge nuclear research for the next 30 years. Left: One of the twin laser bays at the National Ignition Facility. Right: How it works: Beams from the laser are concentrated on a small pellet of fuel in a chamber to produce intense temperatures (like those deep inside stars). 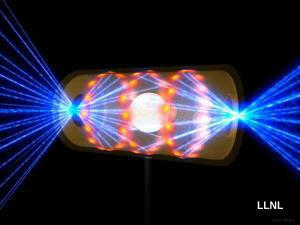 The idea is to produce nuclear fusion (make atoms join together) and release a massive amount of energy. Photo credit: Lawrence Livermore National Laboratory. We can trace the birth of lasers right back to the first two decades of the 20th century. That's when Albert Einstein figured out the quantum theory of light and photons (in 1905) and the mechanism of stimulated emission (in 1917)—the two key components of laser science. But it was another four decades before the first practical laser actually appeared. Artwork: The original maser designed in the late 1950s by Arthur Schawlow and Charles Townes, taken from their US Patent 2,929,922, which I've colored to highlight the main components. You can see how closely it resembles the laser in my artwork in the box up above. Artwork courtesy of US Patent and Trademark Office. Lasers evolved from masers, which are similar but produce microwaves and radio waves instead of visible light. 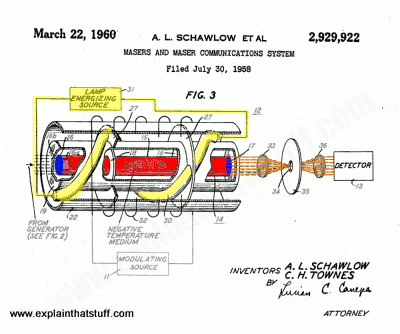 Masers were invented in the 1950s by Charles Townes and Arthur Schawlow, both of whom went on to win the Nobel Prize in Physics for their work (Townes in 1964 and Schawlow in 1981). They applied to protect their invention on July 30, 1958 and were granted US Patent #2,929,922 (Masers and maser communication system) on March 22, 1960 (you can see one of the drawings from it here). But did they invent the laser? In 1957, one of Townes' graduate students, Gordon Gould, sketched in his lab notebook an idea for how a visible light version of the maser could work, coining the word "laser" that we've used ever since. 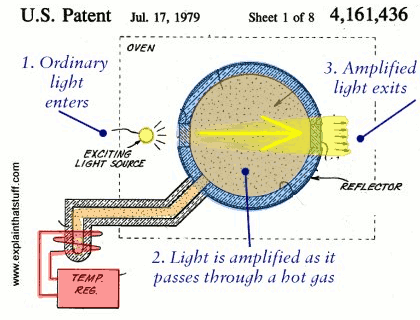 Unfortunately, he didn't patent his idea at the time and had to devote the next 20 years of his life to legal battles, eventually gaining a patent for part of the laser invention (Method of energizing a material) and substantial back royalties in 1977. Although Townes and Schawlow are often credited with inventing lasers, the first person to build a working, visible light laser was actually Theodore Maiman, who has never really gained the recognition he deserved: his original writeup of his work was rejected by the journal Physical Review Letters and, despite twice being nominated for the Nobel Physics Prize, he never won the ultimate accolade. He was, however, inducted into the National Inventors Hall of Fame in 1984 and won many other worldwide honors for his groundbreaking work. Artwork: Gordon Gould's alternative laser is a very different design, but does essentially the same job: amplifying light. Artwork courtesy of US Patent and Trademark Office. Laserfest: A superb website set up to mark the 50th anniversary of the laser's invention. Includes excellent videos by laser pioneers, including Charles Townes and Theodore Maiman, and many other useful articles and resources. Creating Lasers in the Sky by Alexander Hellemans. IEEE Spectrum, March 10, 2015. How can we create focused atmospheric laser beams? Giant Laser Complex Makes Fusion Advance, Finally by Kenneth Chang and William J. Broad. The New York Times. February 12, 2014. Exploring laser-powered progress at the National Ignition Facility. Lasers scan future possibilities by Jonathan Amos, BBC News, 12 May 2010. Explains how lasers became an indispensable part of everyday life—and where the technology is heading next. Lasers lift dirt of ages from artworks by Doreen Walton, BBC News, 26 February 2010. Lasers can be used to blast away dirt, restoring paintings to their former glory. Wired: This Day in Tech: May 16, 1960: Researcher Shines a Laser Light by Randy Alfred, Wired, May 16, 2011. Explains how laser pioneer Theodore Maiman created the first ruby crystal laser. The Race to Make the First Laser by Jeff Hecht. A short account of laser history from Hecht's book Laser Pioneers (see below). Lasers by James Bow. Gareth Stevens, 2016. A 48-page introduction for ages 9–12. Lasers: The Technology and Uses of Crafted Light by Charlene Billings and John Tabak. Facts on File, 2006. A deeper, 208-page overview for ages 10+ (also a good as a non-mathematical backgrounder for adult readers). Beam: The Race to Make the Laser by Jeff Hecht. Oxford University Press, 2005. The early years of the laser, focusing on the work of Townes, Schawlow, and Maiman. Lasers by Anthony E. Siegman. University Science Books, 1990. One of the best introductory books on lasers for college-level students, written by a Stanford Professor. Principles of Lasers by Orazio Svelto. Springer, 1998. Another detailed student text for undergraduates. Laser Pioneers by Jeff Hecht. Academic Press, 1992. The story of the laser, including interviews with 15 of the key pioneers. Inventing the laser at Bell Labs: Charles Townes and Arthur Schawlow are interviewed in this great AT&T archive video from 1988, which explains why lasers were developed, how they work, and what they've done for us. Theodore Maiman Explains the First Ruby Laser: The developer of the first working laser explains his invention in this short archive video from The Optical Society.